2017 was a great year for new skincare products and discoveries. So much great innovative technology, some stripped back to basics or naturally derived. Turning 30 and starting to see small changes in my face and skin has really made me become aware of bad habits I had in my 20’s and in turn, the effects they potentially caused. Habits like: not always washing my face before bed; using highly perfumed and alcohol products; not always wearing sunscreen; and picking, poking, popping and prodding, etc. Diet and Lifestyle haven’t been horrible but could always be better. I’ve never smoked and I only drink socially occasionally. But time and gravity have begun to take it’s toll, so now I’m trying to become hyperaware of what I’m putting on my face. It’s never too early to start taking precautions. Juice Beauty Blemish Clearing Cleanser – This is my favourite new cleanser. I’ve been using it for a couple months now and enjoy how clean it leaves my skin feeling. It’s certified organic and the first 4 ingredients are all fruit/plant derived juice (organic lemon juice, sweet cherry juice, red grape juice and aloe juice). Since using it, I’ve noticed the frequency, severity and size of any pimples that I get are significantly reduced and smaller. Pixi Glow Mud Mask – I love this mask if I feel my skin is producing too much oil in certain areas and creating pimples. It’s a great clarifier with kaolin clay and dead sea mud and works super well as a spot treatment to fight breakouts, yet has plenty of aloe and hydrating oils to keep the skin balanced. 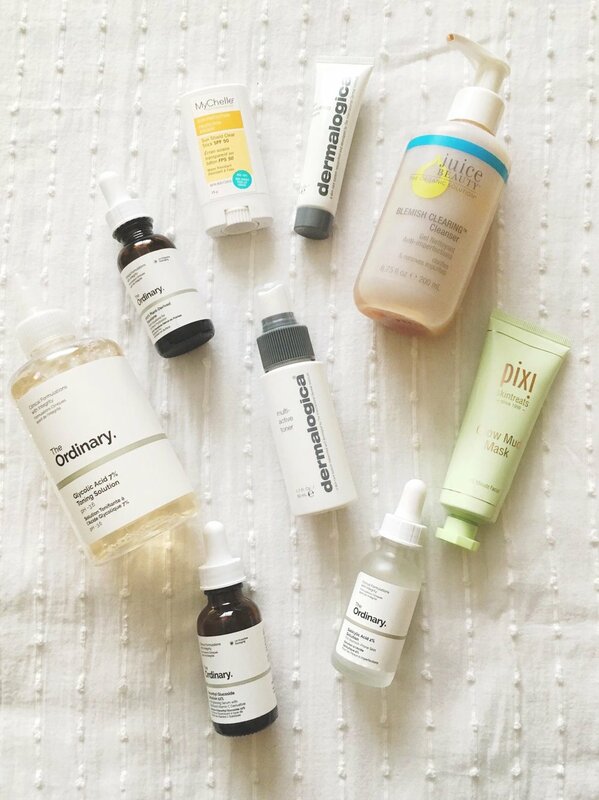 The Ordinary Salicylic Acid 2% Solution – The Ordinary was a great skincare discovery for me this year. In such a short amount of time, their products have enhanced the quality and strength of my skin. The Salicylic Acid keep my pores clean, unclogged and smaller; breakouts are less frequent and when applied as a spot treatment – minimize the longevity of the breakouts. The Ordinary Ascorbyl Glucoside Solution 12% – This is a vitamin C solution that helps brighten and tone the skin. It’s my first brightening product and it’ll most likely be my Holy Grail. After only a few uses I noticed a huge difference in my complexion. From the diminishment of my (inevitable) summer tan, red spots from old breakouts and the evenness of tone in my skin. It also helps with signs of aging! The Ordinary Glycolic Acid 7% Toning Solution – This is a great AHA product for beginners as it’s gently formulated and hydrating. You’ll still get all the effects of a high percentage AHA, with no irritation. I love how much product you get for the price point, the colour and smell are lovely and it feels great to apply. It’s helped with the texture, glow and evenness of my skin. The Ordinary 100% Plant Derived Squalane Oil – This might be my favourite discovery of the year. I had been using Rose Hip Oil prior and found out it’s an unstable polyunsaturated oil which oxidize faster and prematurely age the skin :(. Squalane Oil keeps my skin hydrated, absorbs quickly into my skin and leaves it baby smooth. MyChelle Sun Sheild Clear Stick SPF 50 – It’s almost impossible to find the perfect sunscreen. I was on a mission to find a mineral sunscreen that wouldn’t leave my skin feeling congested and grimey, with a good ingredients list, and optimal sun protection. It was hard. I found one that I’m happy to put on my face. It’s 17% Zinc Oxide and the first few ingredients are Beeswax, Shea Butter, Sativa and Candelilia Oils. Not Bad. Dermologica Skin Smoothing Cream – I’ve come to terms with not being able to find a moisturize loaded with silicones and fillers for an affordable price. This winter my skin need a bit of extra moisture. So I bought the travel size to see if I liked it enough to warrant buying the full size. So far, I like the moisture it provides but am not crazy about the silicones in it. I feel like it may be causing a couple of the breakouts I’ve recently had since using it. But, it’s not too bad.